Ok, so that quote is not exactly right but it’s close enough, and fits this post just perfectly! Food Glorious Food! Mishmash but still eat it. What are you looking for? There is the door! If you desire me, I’ll drink some tea…[insert hand motion to actually drink tea!] Food Glorious Food! Clever, I know…check out that totally awesome rhyming. Oh, and to answer your question, that song makes absolutely no sense at all. The point is, my friend and I wrote it, we were super proud of it, and obviously it was catchy (if I can still remember the words 18 years later). 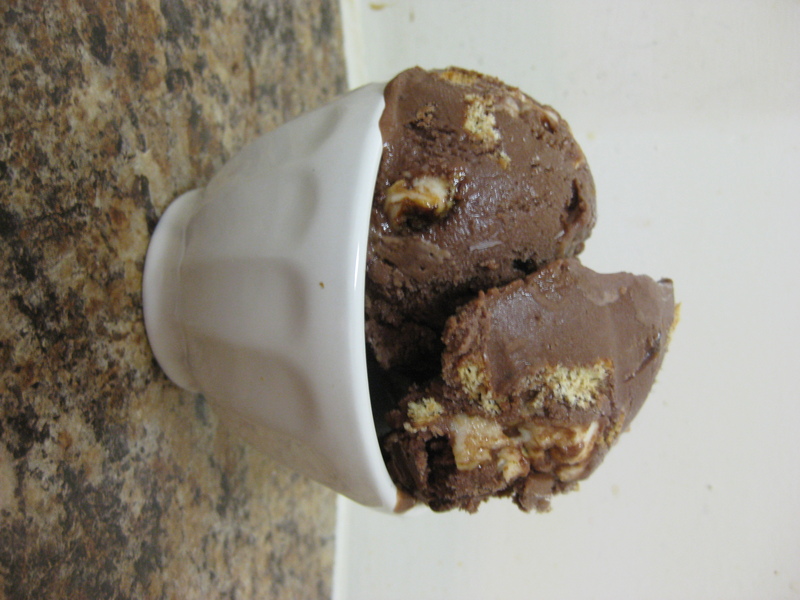 I should have known then that I had a love of all things food…perhaps that song was the precursor to 365scoops. Why am I telling you this hugely embarrassing story? Because it’s a perfect introduction to my s’mores ice cream. As a matter of fact, whenever I think of s’mores this song comes to mind. Most people think of campfires and toasted marshmallows (and I do too!) but I also think of this wacky, strange and totally bizarre-o song. 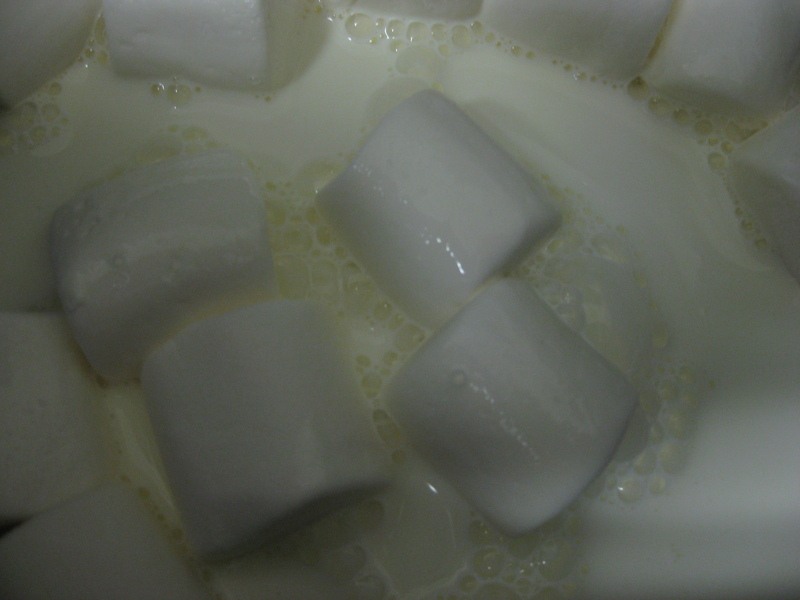 Melt 15 marshmallows and one cup half-and-half over a saucepan until the mixture forms into a liquid. Remove from the stovetop and cool. In a separate bowl mix together the cocoa powder, sugar, brown sugar. 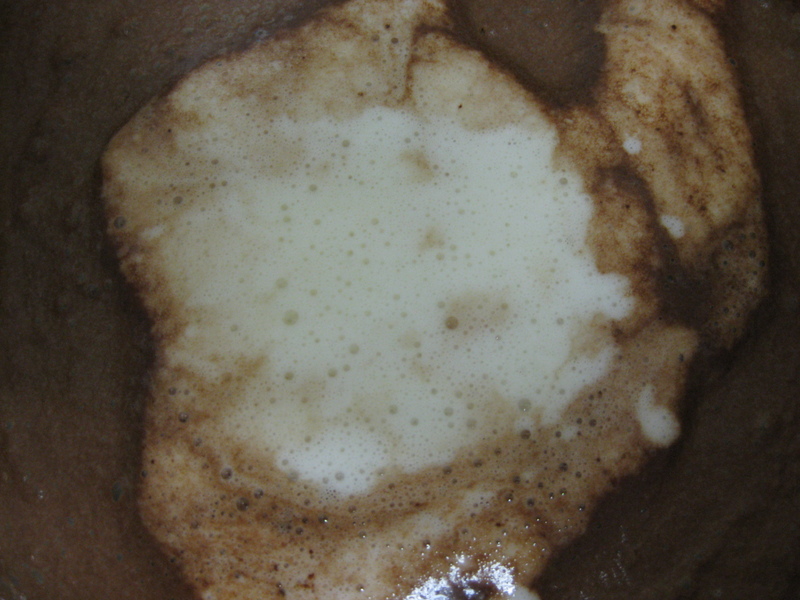 Next whisk in the milk and cream. Add the vanilla extract. Next add the marshmallow mixture into the chocolate mixture and stir well. Though you will not be able to see the marshmallow mixture in the ice cream, it will give it a really silky, creamy texture, and obviously an added sweetness too! Cool the mixture in the refrigerator. In the meantime, roast the marshmallows! Set the oven to broil. 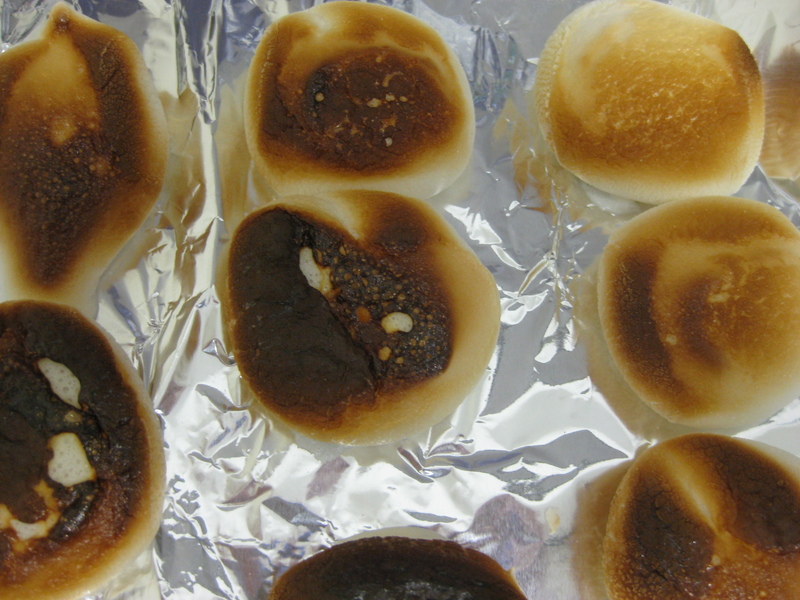 Put 10 marshmallows onto a baking sheet and start toasting them. Keep checking on them and after 4 minutes, turn the baking sheet once. Remove from the oven, flip the marshmallows over, and return to the oven for another 2 minutes (or until they start to look charred). Chop the Hershey’s bars into bite-sized pieces and break the graham crackers into small pieces and set both aside. Remove the ice cream mixture from the refrigerator, and freeze according to the manufacturer’s instructions. Approximately 5 minutes before the ice cream is done, add in the bits of Hershey’s, graham crackers and toasted marshmallows. A word to the wise: when breaking up the marshmallow pieces they are so gooey that you need to wet your finger tips with hot water (so that the marshmallows don’t stick to you). 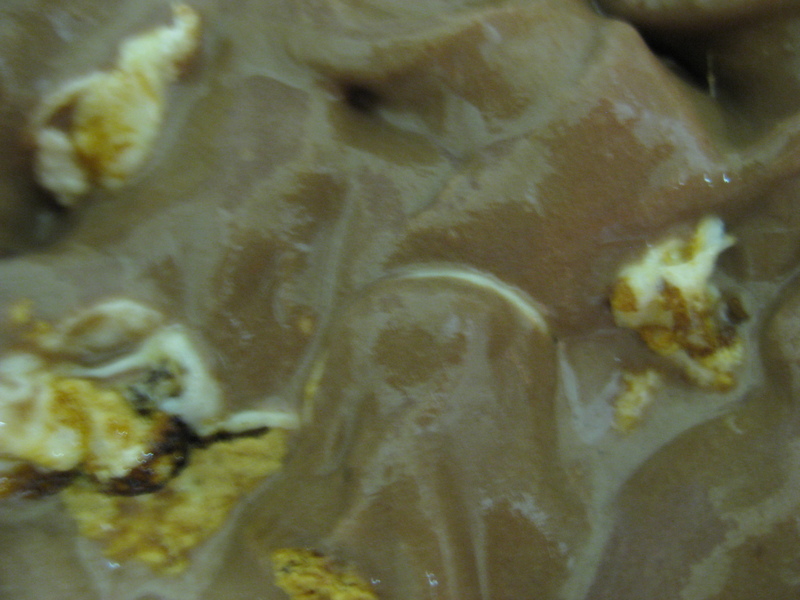 I churned this ice cream for 20 minutes, and it was very “gooey” when finished because of the marshmallow base. Put the ice cream into an air-tight container and store in the freezer for 2 hours before serving. When ready to eat, scoop generously and enjoy! 'Smores ice cream...check out the toasted marshmallows and graham cracker pieces. Yum! The Verdict: Delicious! Please sir, can I have ‘smore? It was a hit and while I was glad to share it with others, I was even happier to have the rest for myself. I may or may not have eaten the remainder (which was a lot) directly out of the container. The best part was the bits of toasted marshmallow which tasted exactly like a campfire. Yum yum yum! Who would possibly make up such a ridiculous song?! After all these years, I’m glad the song is still so inspiring. Thanks! It’s a really catchy tune :) And an even catchier recipe.